On the theory of “better late than never” having just read and reviewed Frazier’s Verona and duly impressed with his writing skillsm I checked our local library to see what else he had written. Thus, I came upon Cold Mountain. I recognized the title from an Academy Award winning movie I had missed seeing….. Published twenty some years ago, this now widely read debut novel was at the top of best seller lists for over a year. It also won many literary awards. They didn’t review it on tv but I did see the ads for it. I read the audio version some years ago. It was engrossing. I liked it a lot. Another must read. I have finally got round to purchasing your last recommendation - Sue Monk's The Invention of Wings. I also liked and admired it. Dear Troutbirder, I read this book when it first came out and was driving along a main thoroughfare in Minneapolis--can't remember it's name but I see it clearly in my mind--when the audio tape was coming to the ending of the novel. I was so overwhelmed by the book and that ending that I had to pull the car over to the curb and finish listening. Thanks for bringing that memory back. Peace. Our family loves civil war books. I'll put this on our list. Thanks for reminding me to read this book. My son loved Cold Mountain too. 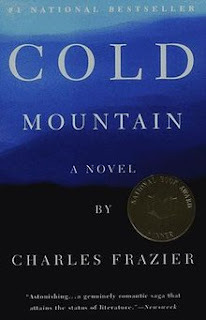 Cold Mountain is a gap in my reading education, too. Glad you liked it. What movie? I was on the road 10 years ago and saw a movie once in awhile in Laredo where there's an empty lot the size of a city block where trucks park so I now have as my first impression your craft work here. I liked the movie, but you know...the book is always better. I shall add it to my "must read" list! We took our grandkids to see the premiere performance of "Cold Mountain" as an opera at the Santa Fe Opera three summers ago, Being a rather dark story with ultimate redemption, the set was consistently dark and probably the story didn't translate well into opera. http://theclassicalreview.com/2015/08/cold-mountain-is-a-long-bleak-night-in-santa-fe-opera-premiere/ My grandkids, the only children there in that beautiful open opera house, stayed awake and engaged I am happy to report. A wonderful book. I read it several years ago. I loved the book and hated the movie. BTW: we live within a few miles of the Cold Mountain for which the book is titled.